(Nanowerk News) It is beyond imagination that one gram of a substance could have a surface area nearly as large as a soccer field. This, however, is true for compounds known as metal-organic frameworks (MOFs). In the near future, MOFs are expected to be used for absorption and reliable storage of large volumes of gases (like hydrogen or carbon dioxide) or for separate gas mixtures. An international team, including scientists from the Max Planck Institute for Solid State Research in Stuttgart, is working on new methods for custom-made and environmentally-friendly synthesis of MOFs materials. In a so-called mechanochemical synthesis, new compounds are produced directly from solid-state reactants by milling. For real-time following of the course of mechanochemical reactions, a new protocol was co-developed by the Stuttgart-based Max Planck scientists. This in situ method provides the opportunity to identify (and thereafter isolate) hitherto unknown structures formed as intermediates during the reactions, which may be particularly useful for practical applications. Imagine two tanks, one empty and the other with filled with small amounts of powder. Maybe it comes as a surprise, but the tank with powder is capable of storing far more hydrogen than the empty one! The reason for this is rooted in a simple physical principle: if the powdered substance contains pores in the crystal structure, then there are numerous binding sites for hydrogen. As a result, the hydrogen molecules are not only stored in the emptiness of the tank, but they are also densely packed within the powder material. Unfortunately, such a tank is not commercially available, yet. Nevertheless, powders with the described properties are already known. Namely, it is likely that a metal-organic framework (MOF) material can be used for this purpose. Researchers at McGill University in Montreal, Canada, and at the Ruder Boskovic Institute in Zagreb, Croatia, are now improving our understanding of how MOFs are formed during environmentally-friendly methods of synthesis. To visualize the reactions courses they are using a special method of in situ X-ray diffraction developed by Robert E. Dinnebier and his colleagues at the Max Planck Institute for Solid State Research. This method makes it possible to continuously monitor structural changes during the chemical reaction, providing valuable information for subsequent modifications of the manufacturing process. The protocol helps to identify – and produce - MOFs with hitherto unknown structures and potentially useful properties. 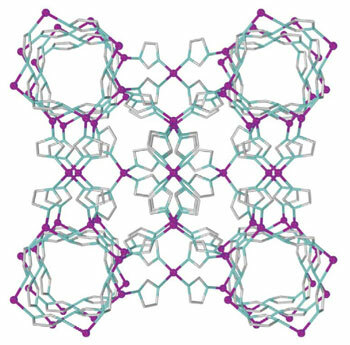 For example, recently, the scientists discovered a previously unknown crystal structure of an important and commercially available MOF. The chemical composition of MOFs dictates their crystal structure, which is often interesting for many applications. MOFs are constructed of metal atoms (such as zinc, copper or chromium, to name a few) interconnected by organic linkers. Together, these metal-organic building blocks form highly regular, three-dimensional structures with large pores within the framework. These resulting pores are able to selectively absorb gases. Storing hydrogen fuel in the tank of a car is only one of many potential applications for MOFs. Depending on the size and cross-section of the pores and channels, MOFs are also suitable for separating gas mixtures. For example, they could be used to separate carbon dioxide from flue gas mixtures, which could then be disposed and sequestered underground. Moreover, gases can undergo reactions within the pores, with the metal atoms acting as catalysts, and speed-up industrially important reactions. Generally, to synthesise an MOF, chemists use a solvent in which a salt of the desired metal is dissolved to react with the organic substance, which serves as a bridge between the metal centres. After the reaction, the solvent evaporates leaving the MOF in a solid form. Taken that this final step costs a lot of energy and using of solvents is environmentally harmful, scientists are working on methods that require no solvents. One alternative is mechanosynthesis, in which a metal compound and an organic substance are simply mixed together in the solid state. The energy required for the reaction is provided by milling and grinding the mixture. For the commercially available MOF ZIF-8 (zeolitic imidazolate framework 8), it was already shown that it can be obtained by grinding zinc oxide together with 2-methylimidazone. “It was not known what actually happens during such mechanosyntheses and how the reactions proceed,” says Robert E. Dinnebier, who heads the Central Scientific Facility X-Ray Diffraction at the Max Planck Institute for Solid State Research. Until now, it was necessary to stop the reaction in order to study the formed products. In a project involving researchers from Canada, Croatia and France, Dinnebier’s team showed how the mechanical synthesis of ZIF-8 can be followed almost continuously in real-time. A technique known as powder X-ray diffraction, which measures the angles at which a powder sample diffracts X-rays was used. The reflections at specific diffracted angles and their intensities provide information on the position of individual atoms and on the atomistic crystal structure. The in situ use of this widespread method for monitoring of solid-state processes requires high-energy X-rays. Namely, the X-rays not only have to penetrate through the reaction mixture but also the reaction vessel. Therefore, short wave X-rays were used, emitted by highly accelerated electrons in particle accelerators known as synchrotrons. For the first time the researchers succeeded in observing the progress of a mechanical ZIF-8 synthesis at intervals of only a few second without any interruption of the reaction. The experiments were not limited to the ZIF-8 system. “With the help of in situ powder X-ray diffraction, we can now generally study how MOF syntheses of all kinds are influenced by process conditions such as temperature, pressure, the quantities of starting substances and excipients, and by the intensity and duration of grinding,” says Dinnebier. Since MOF substances continuously attract scientific and commercial interest, it is important to produce them in an environmentally-friendly and cost-effective manner. In this regard, mechanosynthesis is a very useful technique. “It is important to know the optimum process conditions for such syntheses,” says Dinnebier. As much is known about the mechanisms by which a crystal structure is formed, the easier the production will be. Nature Communications, "In situ X-ray diffraction monitoring of a mechanochemical reaction reveals a unique topology metal-organic framework"
Nature Chemistry, "Real-time and in situ monitoring of mechanochemical milling reactions"